When the 2009 season started, Joe Mauer was in a lot of pain. He had an offseason kidney obstruction that turned into an inflamed joint, leading to a month on the shelf. During his absence, the Twins barely played .500 baseball, winning 11 of 22 games. Mauer returned on May 1st, slugging a home run in his first at bat. He went on to lead the Twins to a division title, and a wonderful come from behind winning season. Mauer was voted MVP today, almost unanimously, for his efforts in one of the best seasons by a catcher in MLB history. In just over 135 games, he batted .365, hit 28 home runs, drove in 96 runs, and played Gold Glove defense. He led the league in OPS, SLG, and OBP, scored just under 100 runs, and claimed his third batting title in four years. In fact, the gap between Mauer in OPS and SLG and his next closest competitor was larger than the gap between his competitors and some of the worst players in the league. That is pretty incredible in itself. As a lifelong Twins fan, I grew up watching Kirby Puckett and Dan Gladden win two titles. Puckett was my favorite player in the world, and I can say to this day, I still have most of my Puckett cards and autographs from that age. My autographed Puckett bat is one of my most prized possessions, and I have vivid memories of how amazing it was to watch those Twins play. Fast forward 16 years, and I am just as much of a fan of Joe Mauer as I was Kirby. Being the hometown guy, I immediately latched on to Mauer’s talent and potential when he was drafted back in 2001. I started collecting his stuff right away, including an autographed game model bat to match Kirby’s. Since that time, I have cheered emphatically for Mauer’s every plate appearance, knowing full well that his success usually means team success too. Although the Twins started .500 without him, they finished 11 games over .500 with him. His ability to call a game, as well his offensive and defensive contributions to a team riddled with injuries to their biggest players was exceptional and deserving of recognition. Because of that prowess, I have been a fan from day one, and I welcome those of you who are just jumping on. Back in 2006, Exquisite Collection was taking the hobby by storm, and Mauer’s cards had yet to reach their value pinnacle. Luckily for me, I was able to pick up this amazing card, which features an autograph as well as a jersey patch in epic fashion. This is one of my favorite baseball cards in my collection. When 2006 SP Authentic hit the market, the letters were a completely new and awesome concept. I worked the boards for one of the rare Mauer redemptions and finally found one for WAY too much money. I didn’t care, and purchased the card without thinking. It is still one of the coolest cards I have, and I am thankful I took the chance, as they are exceedingly rare. I absolutely love this card for the amazing patches as well as the cool design and picture. This was bought during the peak of his first batting title run, so I didn’t get it cheap, yet from the beauty of it, I’m not too worried. I really liked the fact that Mauer’s picture was in the field: this, as well as the low numbering, make this a definite favorite. This one made the list, even though I don’t own it – YET. The card highlights Mauer in the field as well as at the plate, and the auto baseball piece is without a doubt one of the coolest card ideas in history. This card is ridiculously hard to find, and I have yet to be able to find one at a price I can afford. Too bad, because this card would definitely make the shelf with all the rest. 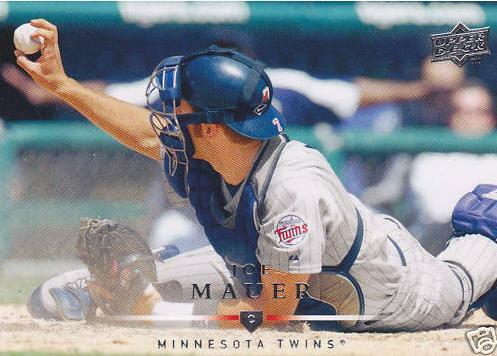 I think this is Mauer’s best photo on a card, ever. Such a cool pic, and I would love to get this card autographed if I ever had the chance. There is no better representation of what Mauer brings to the field as what is on this card, and I encourage you to go pick it up if you have the chance. Although I’m sure 2010 will bring similar tidings for Mauer and the Twins, I cant help but revel in the fact that for 2009 he was the best in the league. I had similar happiness over Morneau’s MVP season in 2006, but this is just a little sweeter. After all, he is my favorite player, and you can’t beat that.